Feel stress evaporate as you experience the essence of mind-body-spirit rituals that are rooted in Asian customs and combined with sophisticated and varied water-based treatments. Relax in an environment that delights all of your senses. Be inspired by our team of wellness experts who can help guide you towards a more enriching lifestyle. Spa Philosophy The quest for good health and beauty through meditation, massage and use of natural herbal remedies is an ancient tradition in Thailand. Experience this tradition, handed down through countless generations, in the restored century-old teakwood house of The Oriental Spa. It is an oasis of peace and tranquillity, voted "Best in the World" by Travel & Leisure magazine. Guests discover the pleasure and benefits of therapies based on traditional Thai and modern Western techniques. 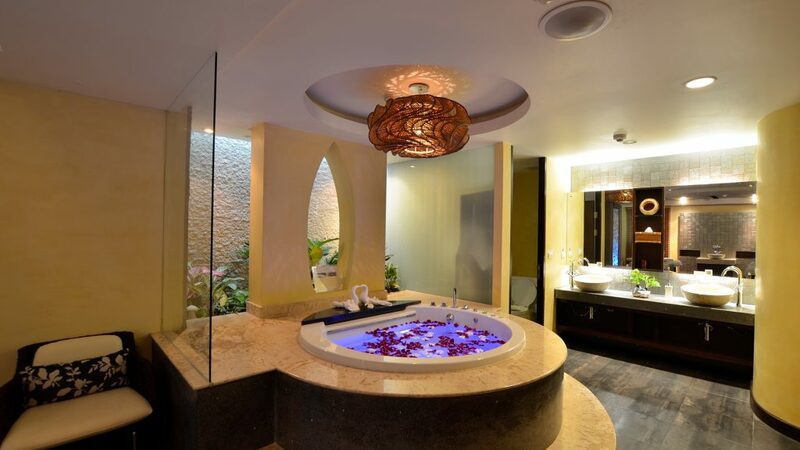 With 14 private suites, The Oriental Spa is exclusive and luxurious. The antique decor is muted, yet treatments and hydrotherapy facilities are state-of-the-art. So soothe away the stress of modern life and dissolve impurities, under the gentle fingers of our therapists who are highly trained in ancient skills. The benefits to body and mind will become obvious from the moment they begin. Embraces a holistic approach to physical and spiritual wellbeing.Inspired by traditional Asian healing philosophies, our treatments are based upon the principles of restoring balance and harmony to mind and body.Featuring the largest and most luxurious private spa suites in Bangkok, complete with memorable bathing and herbal steam facilities, CHI gives you the luxury of personal space and timelessness to indulge your senses, soothe your body and revitalise your spirit. Surrender to CHI's signature treatments, the intuitive touch of our Therapists and the restorative powers of our fragrant oils, aromatic herbs and spices. Meaning "garden in heaven" in Sanskrit, Devarana Spa was especially designed from the concept of the garden situated at heaven's gate as described in ancient Thai literature "Traibhumikatha", written in 1345 A.D. (1888 B.E.) by Phraya Lithai. Devarana Spa will excite the senses and make spa lovers feel truly special: as if you are in heaven. Chiva-Som is a luxury health resort, combining international standards with Thai values and beliefs to deliver personal wellness programmes in a positive, non regimented way. Everything we do focuses on a holistic approach to health that incorporates mind, body and spirit. For the past 10 years, Chiva-Som is the only destination spa to have consistently appeared in the top three of the Conde Nast Traveller (UK) Reader's Travel Awards. Chosen as the "World's Best Destination Spa" in the 2006 Travel+Leisure Reader's Travel Awards, Chiva-Som is also a proud member of the Destination Spa Group (www.destinationspa.com ). The moment you make the decision to visit Chiva-Som is the moment healthy living begins. A journey of discovery is how many of our guests describe their experience. Our emphasis is on reconnecting your mind body and spirit, allowing you to experiment with the endless treatments offered while discovering your own balance, with programs tailor made for you. Our Health & Wellness center is an environment totally conducive to healthy living where you will find complementary treatments from Medical Holistic, Spa, Medi-Spa, Physiotherapy and Fitness. Within the center we have a highly skilled and qualified team of health and wellness professionals including: Body Therapists, Specialist Consultants, Doctors, Nurses, Naturopaths, Physiotherapists, Counselors, and Fitness Trainers dedicated to support you in achieving lasting results. We believe HEALTH stands for Helping Each other Achieve Total Lasting Health and with this in mind have integrated many health modalities to form the Health & Wellness center, a mix of modern and complementary medicine. We pride ourselves on the fact we adjust your program prescription depending on your experience of the treatments during your stay. This allows us and you to monitor your progress relative to your goals. Good health equates to vitality, wellness, peace, harmony, and balance. Nestled among majestic mountain peaks, the Springfield Spa is an oasis of peace and tranquility. Our philosophy aims to harmonize the mind and body in an environment of pure relaxation. Here you will be refreshed, relaxed and rejuvenated. This is a place to sit back and take the serenity, it's what Hua-Hin is about. It begins the moment you step through our front door' health director (Spa): The Spa's co-founder and health director is Dr. Sujitra Napathorn, who specializes in internal medicine and dermatology. She can advise you about special personalized weight programs, Botox or Collagen treatments. Her dedicated staff is certified by Thailand's Ministry of Health. They are continually trained in the most advanced health treatment methods. A sanctuary where mind, body and spirit are nurtured holistically. The Metropolitan, Bangkok, understands its guests are on high-octane schedules. To counteract the pressure, we have opened a COMO Shambhala health club at the hotel - our largest city retreat yet - dedicated to your continued wellbeing. In addition to a gym, we have steam rooms, a hydro pool, 20m outdoor lap pool and yoga studio, with 10 treatment areas where guests can indulge in Asian-inspired, holistic therapies originally developed at our sister resort, COMO Shambhala retreat at Parrot Cay. Treatments include reflexology and Thai massage, all delivered by experienced, specialised practitioners. In addition, we can arrange for private instruction in yoga, or personal trainers.